Owing to difficulties that scholars in and outside China encounter in accessing ‘state secrets,” the exact figure of the “abnormal death” has become a recurring debate in the field of China studies. Estimates by various scholars range from one-half to eight million. According to R.J. Rummel’s 1991 analysis of, the figure should be around 7.73 million. In the following year, however, Harvard scholar John K. Fairbank arrived at a rough estimate of around one million. Several years later, Ding Shu, an overseas Chinese scholar, disagreed with Rummel’s conclusion by using diverse analyses, and estimated the figure to be around two to three million. Recently, Andrew Walder and Su Yang contributed a much more detailed analysis of the death toll in China’s rural areas based upon statistics drawn from 1,500 Chinese county annals. In their estimate, “the number killed [was] between 750,000 and 1.5 million, with roughly equal numbers permanently injured”. In the biography of Mao Zedong by Jung Chang and Jon Halliday, the estimated totality of death is discussed: “at least 3 million people died violent deaths and post-Mao leaders acknowledged that 100 million people, one-ninth of the entire population, suffered in one way or another.” Interestingly, the reporter of a Hong Kong-based political journal released the classified official statistics, according to which nearly two million Chinese were killed and another 125 million were either persecuted or “struggled against” (“subjected to “struggle sessions”) as a result of the state-sponsored killings and atrocities committed during the Cultural Revolution. The average death toll based on the aforementioned six investigators’ figures is nearly 2.95 million. Considering that the Cultural Revolution took place in China during a period when it was not invaded by other states, the number of victims estimated above is extremely high.The widespread phenomenon of mass killings in the Cultural Revolution consisted of five types: 1) mass terror or mass dictatorship encouraged by the government---victims were humiliated and then killed by mobs or forced to commit suicide on streets or other public places; 2) direct killing of unarmed civilians by armed forces; 3) pogroms against traditional “class enemies” by government-led perpetrators such as local security officers, militias and mass; 4) killings as part of political witch-hunts (a huge number of suspects of alleged conspiratorial groups were tortured to death during investigations); and 5) summary execution of captives, that is, disarmed prisoners from factional armed conflicts. The most frequent forms of massacres were the first four types, which were all state-sponsored killings. The degree of brutality in the mass killings of the Cultural Revolution was very high. Usually, the victims perished only after first being humiliated, struggled and then imprisoned for a long period of time. Mao’s atrocities The very beginning of the Cultural Revolution in China immediately led to violent mass chaos in June 1966. As indicated by a militant editorial on June 1 in the People’s Daily, an official guideline for the Cultural Revolution, the main purpose of this unprecedented political campaign was to ‘sweep Away All Cow-Demons and Snake-Spirits,” which not only included traditional class enemies such as the “Five Black Categories” (landlords, rich peasants, counter-revolutionaries, bad elements, and rightists), but also “capitalist-roaders in the Party” (cadres) and “reactionary academics” (teachers and other intellectuals). On July 28, 1966, Jiang Qing, Mao’s wife and a key figure of the Central Cultural Revolution Group, conveyed Mao’s instruction regarding mass violence at a students’ rally: “If good people beat bad people, it serves them right; if bad people beat good people, the good people achieve glory; if good people beat good people, it is a misunderstanding; without beatings, you do not get acquainted and then no longer need to beat them.” In other words, Mao thought the government “should turn a blind eye to violence as an inevitable by-product” of the Red Guard mobilization. In August, the main target of the Red Guards’ agitation shifted from campuses to the society at large. Xie Fuzhi, the Minister of Public Security, mirrored Mao’s attitude. In an important internal meeting, he directed all police stations and other security forces to assist Red Guards in identifying “reactionary” households for searching, beating and deportations. On August 22, at the climax of the mass terror in Beijing and other major cities, the CCP CC issued a directive entitled ‘stipulations of the Ministry of Public Security forbidding the use of police force to suppress the revolutionary student movements,” which fueled the violence and put the targets of the Red Guards, several thousand people, in a virtually defenseless position. As a result, a significantly increased mass violence was perpetrated against those residents with “bad” family backgrounds: their houses were searched, their personal properties confiscated and then the entire households were expelled from the city to the countryside. A mob of thousands of Red Guards also roamed the cities’ streets and attacked any person whom they believed to have hobbies and consumer habits associated with the bourgeois class; the targeted individuals were then subjected to violent ‘struggle sessions.” When the waves of unrestricted violence swept over major cities all over China, ruthless mass killings ensued. 1966; August 5 : Ms. Bian Zhongyun, the deputy principal of the Beijing Normal University Female Middle School, along with four other school educators, was attacked by the Red Guards on groundless charges. Bian died after several hours of humiliating treatment and brutal beating. This was the first case of the killing of educators in China by the Red Guards and other militant students. Many more cases followed, and the brutality escalated rapidly. Thousands of educators were publicly denounced and physically abused in “struggle sessions” by the rampaging students in Beijing’s secondary schools and universities. This includes 20 documented cases of killings y the Red Guards. The mass violence soon spread off campus, as the Red Guards beat seven residents of the same middle school to death in the city’s neighborhoods. In the District where this school was located, 333 residents were killed by the Red Guards at middle schools in August 1966 alone. 1966; August 18---September 30: Spurred by the remarks of Mao Zedong and Lin Biao at the Mass Rally of August 18 on Tiananmen Square, in which the high-school militants were praised as “national models” and openly called on to “be valiant,” another major outburst of violence occurred in Beijing. As a result, 114,000 homes were invaded and ransacked, and foreign currency, gold, and other valuables worth 44.8 million Chinese yuans (dollars) were confiscated. 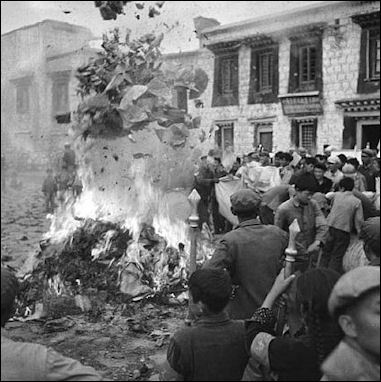 The Red Guards burned 2.3 million books and 3.3 million paintings, art objects, and pieces of furniture. Furthermore, 4,922 of the 6,843 officially designated “places of cultural or historical interest” in Beijing were destroyed. With the help of the city’s public security officers, the Red Guards expelled 77,000 people (1.7 percent of the population of Beijing) from their homes in the urban district to the remote countryside. The mass killing crested during the last week of August, when an average of more than 200 people perished every day. The official death toll in Beijing for the month after August 18 was 1,772. 1966; August 26 - September 1: Mass killings of “class enemies” in the urban area of the capital were repeated in the form of a more severe pogrom in both Daxing County on the southern outskirts of Beijing, and in Changping County north of the city. A speech by Xie Fuzhi, the Minister of Public Security, to the municipal public security meeting was interpreted by the leaders of the County Bureau of Daxing Public Security as the qualified sanctioning of mass violence against “class enemies.” Soon afterwards, a call for immediate extermination of all “class enemies” was initiated and organized by the commune level leaders and released to all lower levels of authority on August 26. The brutal butchery was executed by local militiamen and the Party activists. In total, in all 13 communes and 48 production brigades of the County, 325 “class enemies” and their family members were killed; 22 households were wiped out entirely. Among those victims, the oldest was 80 years of age, and the youngest only 32 days. This was the first pogrom in rural areas in the Cultural Revolution. 1966; August 23---September: Under support of the CCP CC, Beijing Red Guards traveled to all major cities in China to promote their revolutionary violence. Inspired by these missionary forays from Beijing, in Shanghai, 84,222 houses of “bourgeois” families were searched and their personal properties were confiscated by local Red Guards. Among them, 1,231 were the homes of intellectuals or teachers . In the month of September alone, 534 people were killed and 704 were forced to commit suicide in Shanghai. 1966; August---October: Soon after excursions of Beijing Red Guards arrived in the major cities, the Beijing model of Red Terror was repeated in locations all across China: temples and churches were raided, books were burned, “class enemies” were beaten up, their homes were ransacked, and many of them were packed off to the countryside. In China as a whole, about 397,000 urban residents were expelled from the cities to their ancestral villages. In Wuhan city, Hubei Province, 32 private citizens were killed and 62 were forced to commit suicide. In the Qinzhou area of Guangxi Province, 11,979 teachers in middle and elementary schools were assaulted as part of mandatory “group training” to “purify the teachers” ranks.” As a result, 266 were beaten to death or driven to commit suicide; 108 were permanently disabled, and 5,668 were expelled to the countryside for “reform through labor” . In Tiandeng County, as well as in Guangxi, the Cultural Revolution began in July 1966 with the detention and investigation of 1,632 school teachers. The County then experienced a wide range of factional fighting, arrests and torture, and by the end of 1968 more than 1,651 were dead . In some rural and even remote border areas, the first wave of mass violence of the Revolution also made the death toll higher than normal. In Baoshan County, one of the 11 counties of the Greater Shanghai area, the violence claimed about 70 lives during the period. In Zhenxiong County of Yunnan Province, a small border region, 3,000 people were beaten up, and ten were killed in August. In sum, the Red Terror was responsible for the death of at least 100,000 people across the nation . During the political campaign of criticizing Liu Shaoqi (the President of the State) and Deng Xiaoping (General Secretary of the Party), Mao’s key rivals, in the late months of 1966, the mass organizations, including the Red Guards, were divided into two rival factions nationwide: rebels and conservatives. The former was closer to Mao’s goal of a new purge to shake up the entire Party and state apparatus, but the latter was more devoted to the old Party officers and local governments. On December 26, 1966, at his 73th birthday party, Mao called for an “All-round Civil War” to resolve the complex issue. Mao did not address the controversial issue directly. Instead, he and the Party Central issued the “Decision to Provide the Revolutionary Masses of the Left with Firm Support from the People’s Liberation Army (PLA) to call on the military to support “Left” mass organizations for a power-seizure campaign on January 11. However, the military’s involvement in the political campaign soon turned the movement into one of the bloodiest episodes of factional warfare. First, while the Party Central required the military forces to support “Left” revolutionary rebels, it did not clearly indicate who the “Left” was. Since Mao and the Party Central authorized the military to suppress any counterrevolutionary mass by force, the green light was given for armed troops to kill unarmed civilians if the army judged any specific mass organization as “Counterrevolutionaries.” Second, many local and regional military districts had worked closely with local, regional and provincial governments during the previous 16 to 17 years. It was therefore not surprising that they would naturally support the conservatives to repress the rebels during the factional conflicts. Finally, for a very long period of time since the Land Reform of the late 1940s, the Chinese military had not been involved in civilian mass movements. Perhaps the only experience the Chinese army had was the suppression of landlords and other “class enemies” by force in the Land Reform movement, which may provide us with a rationale to understand why Chinese military officers in either local People’s Armed Force Departments or new revolutionary committees organized so many pogroms against “class enemies” in rural areas from 1967 to 1968. On January 6, 1967, the Cultural Revolution’s factional activism moved to a new level when Shanghai rebel factions launched the so-called January Storm, during which they seized the authority of the Shanghai Party Committee and the committee of the Shanghai People’s Congress. The year 1967 was known as the year of “All-round Civil War” in China. Because of the military’s involvement, large-scale armed conflicts broke out throughout the whole country. According to post-Mao disclosures of military statistics, there were at least 18.77 million guns (from pistol to machinegun), 14,828 cannons, 2,719,545 grenades, and millions of other ammunitions in civilian hands for their factional armed struggles. In some areas, such as Chongqing city of Sichuan Province, Xiamen city of Fujian Province, and Changchun city of Jilin Province, advanced tanks, modern armored vehicles and new warships were all used in factional battles. The casualty figure in nationwide armed struggle was approximately half a million. A more recently released CCP secret document also gave estimates of 237,000 people killed, and another 730,000 permanently disabled in the armed struggles during this period. Aside from the spontaneous armed battles among factional masses and the massacres, incidents such as military forces killing unarmed civilians, pogroms against “class enemies,” and a huge number of alleged conspiratorial groups being tortured to death in the course of investigation escalated to a high point across the nation in this tumultuous period. 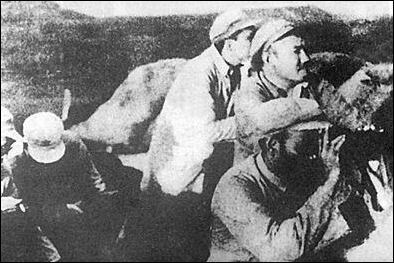 1967; January 25-26: The first mass killing of unarmed civilians by military force with machine guns and submachine guns happened in Shihezi city of the Xinjiang Uyghur Autonomous Region, which was called “the first shot during the Cultural Revolution.” During a power-seizure movement in the Production and Construction Corps of the Xinjiang Military Region in Shihezi city, the military Independent Regiment supported one conservative mass organization because it was close to the Corps Party Committee. However, the other mass organization, the rebels, had launched a power-seizure campaign earlier in the Corps and the city. In order to help the conservatives to take back power from the rebels, the leaders of the military Independent Regiment launched armed attacks against civilian rebels. During two days of violent encounters, 26 people were killed and 74 injured . 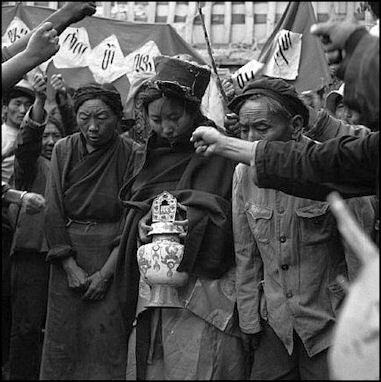 1967; February 23: The second mass killing of unarmed civilians by the military happened in Xining city, the capital of Qinghai Province. Following the directive from Beijing, authorizing military control of newspapers and radio stations, the PLA Qinghai Provincial Military District sent troops to take over the provincial newspaper, Qinghai Daily, from the hands of rebel civilians. After the rebels refused to give possession of the newspaper office building to the army, General Zhao Yongfu, the deputy commander of the military district, decided to use force. To create a pretext for killing, the military fabricated a story, in which it was claimed that the civilians---who were in reality unarmed---fired on troops first from the newspaper office building. As the armed troops moved into the building by force, 169 civilians were killed and 178 injured . 1967; February 24: Armed troops in Xining city of Qinghai Province continued to suppress the rebel civilians by force: Twelve students were killed or injured at Qinghai Ethnical College . 1967; June 28: Two rival mass organizations in Ganzhou city, Jiangxi Province had light violent encounters. However, the leaders of the Ganzhou Military Sub-District and the People’s Armed Force Department of the County decided to distribute weapons to the conservative mass they supported. As a result, about 223 rebel civilians were killed. After the incident was reported to the Party Central, Mao decided to re-organize the leadership of the Ganzhou Military Sub-District and the Jianxi Provincial Military District . Serve the People 1967; July 20: Together, military forces in Wuhan Military Region, Hubei Province and the conservatives resisted Mao’s instructions regarding the movement in that region through several armed demonstrations in the city and even in front of Mao’s hotel. This incident was soon denounced by Mao and the CCP CC as the “Wuhan Anti-revolutionary Incident.” The Wuhan Military Region was re-organized, and the mass organization of conservatives was suppressed by the new military leaders and rebels. During the crackdown, nearly 184,000 people were killed or tortured over the entire province. In Wuhan city alone, about 600 were killed and 68,000 were tortured or permanently disabled. The Cultural Revolution ravaged Chongqing. The city experienced some of the heaviest losses of that event as a result of a clash between two rival gangs of Red Guards who seized weapons from the city's munitions factories. They fought so fiercely that much of the population fled. Betweem July - September 1967 there were ferocious factional armed struggles between two mass organizations in Chongqing, involving tanks and machine guns. During 22 large-scale armed conflicts, 1,737 captives and other unarmed civilians were executed by both sides. 1967; August 13 - October 17: Pogroms in Dao County, known as the Dao County Massacre, took place in the rural area of Hunan Province. This resulted in the deaths of 4,519 individuals, among whom 4,193 were killed outright and 326 were forced to commit suicide. The mass killing was led by the army officers and the leaders of the Dao County militia headquarters, with cooperation from local militias and mobs. Nearly 90 percent of all victims and their family members were labeled as “class enemies,” i.e., belonging to the so-called “Five Black Categories”. The massacre also provoked similar slaughters in the neighboring rural areas. Between August 18 - October, 1967 about 1,092 “class enemies” were executed by local militias and mobs in Ningyuan County, a neighboring area of Dao County. In most of these cases, entire households were wiped out. Between August 29 - October 25 a mass slaughter of 898 “class enemies” by local militias and mobs took place in Jianghua Yao Autonomous County, a neighboring area of Dao County. 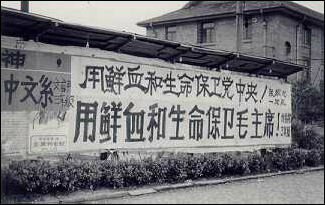 slogans 1967; August 24: Armed troops at Wuzhou Military Sub-District, Jiangxi Province attacked rebel civilians, and then soldiers of the field army units who were sent by the Party Central to support the rebels. While two rival mass organizations in Wuzhou city had several fierce conflicts, the leaders of Wuzhou Military Sub-District not only provided weapons to the conservative faction but were also directly involved in armed assault on rebels. However, commanders of the newly re-organized Jiangxi Provincial Military District supported the rebels, and field army units were sent to Wuzhou area to help the latter on August 24. The troops of Wuzhou Military Sub-District and militias ambushed the field army units, which resulted in five dead and 55 injured. This incident was denounced by Mao and the Party Central as “armed rebellion.” During the whole course of armed struggles between two factions and their supporting troops, the death toll was 65. The goal of the Cultural Revolution was not only to purge Mao’s rivals from the Party nationwide, but also to create new organs of power. According to Mao’s original vision, the new form of government---the revolutionary committee---was to have been established in every jurisdiction by February 1968, the Chinese New Year. However, since his policy led to the “All-round Civil War” in China, half of the revolutionary committees had still not been set up at the provincial level at the beginning of 1968. In order to pave the way for the establishment and enhancement of these new organs of power as soon as possible, Mao launched several new political campaigns, which led directly to mass killings on the largest scale to occur during the Cultural Revolution. From the end of 1967 to the beginning of 1968, Mao and the Party Central led the first campaign denoted “Cleanse the Class Ranks.” The goal of this campaign was to uncover imaginary “class enemies”---typically traitors, spies, and capitalist-roaders within the Party and capitalists, KMT (the Nationalist Party, now in Taiwan) dregs, and those of the “Five Black Categories” “who had supposedly infiltrated the revolutionary camp and contaminated the class ranks. The goal and policy of the campaign provided local authorities with great opportunities to eliminate opponents by creating many falsified cases, such as those against alleged conspiratorial groups and “undercover enemies,” through the use of systematic torture, trial by suspicion, conviction by forced confessions, pogroms and other forms of mass killings. The campaign lasted longer and claimed more lives than any other movement during the Cultural Revolution. The death toll of this campaign was estimated as over half a million, and at least thirty million people were subjected to’struggle sessions” and tortured. On July 3 and July 24, 1968, the CCP CC issued two Public Notices to the entire nation, in which the Party Central and Mao sternly ordered mass factions to end the armed conflicts immediately. However, to establish order and revolutionary power, the public notices also gave the green light to regional and provincial military and government leaders to suppress one of the mass factions---usually the rebels---by armed force. In some provinces, such as Guangxi and Guangdong, the suppression turned into new, large-scale massacres of unarmed civilians in the dissident mass faction. In September 1968, a few months after the bloody suppression, revolutionary committees were established in all the provinces of China. It was evident from government statistics released after the Cultural Revolution that 1.87 million people were persecuted as traitors, spies, and counterrevolutionaries, and over 284,800 were arrested or killed during the ten-month period from February to November 1970. Prominent among the persecuted “counterrevolutionaries” were those who openly criticized the Cultural Revolution. Among a total of 10,402 political prisoners who officially received death sentences in the Cultural Revolution, the majority were executed in the course of the “One Strike and Three Antis” movement. All together, the number of people affected by this movement and the previous campaign of “Cleanse the Class Ranks,” either as victims or as family members of the victims, reached the unprecedented level of one-eighth of China’s population. Another estimated death toll, by Ding Shu, an overseas Chinese scholar, was approximately 200,000 for this campaign, close to the above-mentioned figure from government statistics. 1968; January 1---May 11: In the name of “Cleanse the Class Ranks” and “defending our red organs of power,” indiscriminate killings took place across Guangxi Province, especially in the rural areas. Some major falsified cases, such as the “Anti-communist Army of Patriots” and other “Anti-revolutionary organizations”, were created by the newly established revolutionary committees of the local and regional levels as a pretext for massacres. During this time span, about 18,000 civilians, categorized as members of “Anti-communist Army of Patriots” and other “class enemies,” were killed. Other parts of China such as Jiangxi, Liaoning, Heilongjiang, Shanxi, and Jiangsu Provinces, exhibited a similar pattern. The average death toll in each of the 2,000 counties in China was above 100. However, the death toll in a number of counties greatly exceeded this average. For instance, the pogroms against “class enemies” were also scattered across the rural areas of Jiangxi Provinces: 270 were killed in Xinguo County, 300 in Ruijin County, and over 500 in Yudu County. 1968; January---1969: One of the biggest political witch-hunting cases - that of the so-called “Inner Mongolia People’s Revolutionary Party” - was created by the Inner Mongolian Revolutionary Committee under the orders of Kang Sheng and Jiang Qing, Mao’s close collaborators. Soon Special Cases Personnel, torture chambers, illegal courts and prisons appeared throughout Inner Mongolia. Fabricated charges and forced confessions led to the persecution of a vast number of people as alleged members of the new “Inner Mongolia People’s Revolutionary Party”. The cruelty of the persecution not only matched the worst in Chinese history, but was also on a massive scale. According to an official source, some 346,000 people were framed and randomly accused, 75 percent of whom were Mongols, and widespread humiliation and torture led to 16,632 deaths and 87,180 cases of permanent deformity, making this program of fabricated cases one of the gravest episodes of injustice during the Cultural Revolution. However, according to statistics from an unofficial source, the death toll was at least 40,000; 140,000 reached the point of permanent deformity, and nearly 700,000 were persecuted. On March 9, 1979, the Inner Mongolia Party Committee finally announced the complete rehabilitation of the case, with the approval of the CCP CC. 1968;January---1969: During the campaign to “Cleanse the Class Ranks,” Chen Boda, one of Mao’s top lieutenants and the head of the CCP Cultural Revolution Group, capriciously claimed that there was “an underground KMT network” inside the CCP organizations in Hebei Province. It soon resulted in 2,955 dead; 763 were permanently disabled and 84,000 individuals, including many cadres, were persecuted and subjected to violent ‘struggle sessions.” In Yunnan Province, following on Kang Sheng’s slandering of Zhao Jianmin, the Provincial Party Secretary, as “a hidden traitor and KMT spy,” a fictitious “Zhao Jianmin KMT Spy Agency in Yunnan” was investigated, and under this pretext millions of cadres and common people were persecuted. In the end, this fabricated case resulted in 17,000 deaths and 61,000 cases of permanent deformity, in addition to a total of 1.38 million people being wrongfully persecuted. 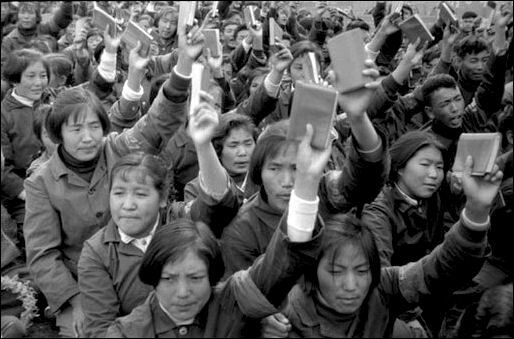 1968; May: The campaign to “Cleanse the Class Ranks” reached its climax in Shanghai. According to statistics by the Shanghai Revolutionary Committee, 965 cases were listed as important ones, in which 731 were members of “Counterrevolutionary Cliques.” In all, 169,405 people were wrongly persecuted, and 5,449 were tortured to death or forced to commit suicide. 1968; August 28: The campaign to “Cleanse the Class Ranks” reached its peak in Beijing, where 68,000 of various “hidden class enemies” were uncovered and abusively subjected to ‘struggle sessions.” From July to August, 430 victims were beaten to death. By February 28, 1969, a total of 99,000 “class enemies” had been ferreted out. According to official statistics in 1987, 9,804 people were tortured to death or forced to commit suicide. 1968; January 1---May 11: In the name of “Cleanse the Class Ranks” and “defending our red organs of power,” indiscriminate killings took place across Guangxi Province, especially in the rural areas. Some major falsified cases, such as the “Anti-communist Army of Patriots” and other “Anti-revolutionary organizations”, were created by the newly established revolutionary committees of the local and regional levels as a pretext for massacres. During this time span, about 18,000 civilians, categorized as members of “Anti-communist Army of Patriots” and other “class enemies,” were killed. 1968; April 30: Eight companies of armed troops in the Guangxi Provincial Military District attacked a rival mass faction in Ningmin County in the same province. In the battle, 108 noncombatants were killed and several cases of torture followed. This armed suppression was organized directly by leaders of the Preparation Group of Guangxi Provincial Revolutionary Committee and Guangxi Provincial Military District with the approval of the Party Central in Beijing. In their petition to Beijing, dated March 15, for the use of military force, the Guangxi leaders claimed that the mass organization was a “Counterrevolutionary organization” and one of the major obstacles to the establishment of new organs of political power in Guangxi Province. 1968; May 17---July: A special report concerning plans to eliminate the “Anti-communist Army of Patriots” across the entire province was sent to the Party Central in Beijing by leaders of the Preparation Group of Guangxi Provincial Revolutionary Committee and Guangxi Provincial Military District on May 17. With the approval of the Party Central in Beijing, indiscriminate killings of members of the “Anti-communist Army of Patriots” and other “class enemies” reached a peak. In Nanning city, a total of 3,547 alleged members of the “Anti-communist Army of Patriots” were tortured into confessing their “political crimes,” and 71 people were killed or forced to commit suicide. In Baise Special District, 9,274 people were subjected to violent ‘struggle sessions”; 1,073 were beaten to death, and 2,135 were abused to the point of permanent disability. In Wuming County, the newly established revolutionary committee held 11 mass rallies to denounce the “Anti-communist Army of Patriots.” In the process, 1,546 suspects and other “class enemies” perished, and 698 were killed during the rallies. In Shanglin County, 334 people were killed as members of the “Anti-communist Army of Patriots” or as other “undercover class enemies” in only four days from June 29 to July 2. 1968; July 3---Beginning of August: Under the orders of “Implementing the July 3rd Public Notice by the CCP CC,” Wei Guoqing, the CCP’s First Secretary of Guangxi Province and the First Political Commissar of the Guangxi Military District, organized armed forces and local militias to openly kill rival mass faction members. By the end of July, 12 companies of armed troops in Guangxi Provincial Military District attacked the mass faction in Nanning city, killing 3,951 and capturing 9,840. After the battle, 2,324 of the disarmed prisoners were executed. In Fengshan County, armed troops and local militias arrested about 10,000 individuals and killed 1,016 noncombatants from the rival mass faction. 1968; July 26---August 6: Wang Jianxun, President of the Binyang County Revolutionary Committee, Guangxi Province and a deputy-commander of an army division, directly organized a mass killing of the so-called “twenty-three kinds of class enemies” across the entire county. In only 11 days, 3,681 people were executed by local public security officers and militias. Among those victims, 176 households were wiped out completely. In contrast, in the eight years of the Anti-Japanese War (1937-1945), the total number of victims killed by the Japanese army was only about 300 in the same county. 1968; May 13---August 30: In the bloodiest suppressions of the rival mass faction led by provincial and local government leaders in Guangxi Province, the victims were not only beaten to death but sometimes even their flesh, hearts and livers were brutally consumed by the killers. At least 10 to 20 thousand members of militias and mobs participated in the cannibalization waves across the province. During this period, cannibalism became a trend widely diffused over ten counties, and resulted in a total of 300-400 victims. Among them, Wuxuan County had the most notorious and the highest number of cases. Among the total of 524 dead victims in that County, about 100 were cannibalized by local militias and mad mobs. 1968; July 4: Mao Yuanxin, Vice-President of the Revolutionary Committee in Liaoning Province and Mao’s nephew, was in charge of the campaign to “Cleanse the Class Ranks.” He created a model of “Mass Dictatorship” for the campaign in the entire province to endorse illegal arrest, torture and imprisonment, which resulted in a death toll of over 20,000 in a two-year period from 1968 to 1969. 1968; August---October: Mass killings against rival mass factions occurred widely in Guangdong province led by the new provincial and local revolutionary committees. Out of all 57 counties in the province, 28 experienced two types of massacres: 1) pogroms against traditional “class enemies” by government-led perpetrators; and 2) mass killings in political witch-hunts by new organs of power. The average death toll in six counties, Yangchun, Wuhua, Mei, Lianjiang, Guangning and Lian County, exceeded 1,000. The highest death figure among these six counties was that of Yangchun County. During the two months from August to October, 2,600 people were killed. 1968; August: Armed forces in Dan County, Hainan Island Special District of Guangdong Province, led by the local revolutionary committee, attacked the rival mass faction with the purpose of “implementing the July 3rd Public Notice by the CCP CC” and “defending the new red regime.” Killed were 700 unarmed civilians, with 5,000 arrested and tortured. 1969; April: According to governmental statistics, a total of 430,000 “hidden class enemies” were uncovered during the campaign to “Cleanse the Class Ranks” in Anhui Province. Among them, 188,225 were officially arrested by police; 1,433 were tortured to death, and 4,646 were driven to commit suicide. The first internal power struggle was between Mao and his hand-picked successor, Lin Biao, because Lin’s power in the army as well as in the Party leadership had apparently become too strong in Mao’s view. This inter-power struggle had a dramatic result, in which Lin Biao and some of his family members fled in panic and died in a plane crash in Mongolia on September 13, 1971. All of Lin’s associates in the military and the Party were subsequently arrested. The second internal conflict was between Mao and Deng Xiaoping/Zhou Enlai. The Lin Biao incident was a heavy blow to Mao, leaving Premier Zhou Enlai as the second leader next only to Mao. In order to balance the power in the Party Central, Mao made a series of concessions with the veteran leaders he had formerly denounced. In particular, he recalled Deng Xiaoping, Liu Shaoqi’s main assistant, back to office from exile in 1973. However, despite having promised Mao that he would never reverse the verdicts of the Cultural Revolution, Deng, sharing Zhou’s unvoiced critical view of the Cultural Revolution, took a much more aggressive approach in his effort to combat Mao’s close associates such as Jiang Qing and Zhang Chunqiao. To ensure the continuation of his Cultural Revolution legacy, Mao finally decided to purge Deng from the central leadership again in November 1975, one year before his own death in 1976. However, this period did not witness a peaceful ending of mass killings. First, the political campaigns before 1972, such as the campaigns of “Cleanse the Class Ranks,” “One Strike and Three Antis” and “Investigation on the May 16 Counterrevolutionary Clique,” had not been officially concluded. Second, the new purges of the internal power struggles inevitably created new political witch-hunts against other people and cadres. Third, any uprising from people to oppose the Cultural Revolution was ruthlessly suppressed by Mao and the CCP CC. Finally, armed force was used to suppress ethnic conflicts. 1975; July 29---August 18: With Mao’s approval, Deng Xiaoping, PLA’s Chief of Staff at that time, ordered military troops to attack Shadian, a Muslim hamlet in Yunnan Province. A large armed force was used, which included a division from the 14th Corps, soldiers from Mengzi military sub-district, one artillery regiment, and thousands of local militias. The whole town was razed, and more than 1,600 unarmed civilians, including 300 children, the elderly and the sick attempting to flee, were killed. 1976; April 5: The gathering of millions of people at Beijing’s Tiananmen Square during the Qingming festival season in early April 1976 was at once an outpouring of grief over the death of Premier Zhou Enlai and a mass protest against the cultural revolutionaries within the CCP leadership---namely, Mao and his inner circle. With Mao’s approval, over ten thousand soldiers, policemen and militiamen were deployed at Tiananmen Square on April 4-5 to crack down on the uprising. Since this movement was taking place simultaneously in major cities across the nation, the severe crackdown was widespread all over China. A detailed German study cited Hong Kong estimates to the effect that “millions were drawn in nationwide,” and a Taiwan intelligence source claimed that “close to 10,000 lost their lives, nationwide.” Formally redressed two years after the Cultural Revolution, the Tiananmen Incident, as part of a broader April Fifth Movement in urban China, not only pronounced the bankruptcy of the Cultural Revolution but also marked the first instance when ordinary citizens came together and challenged the regime.